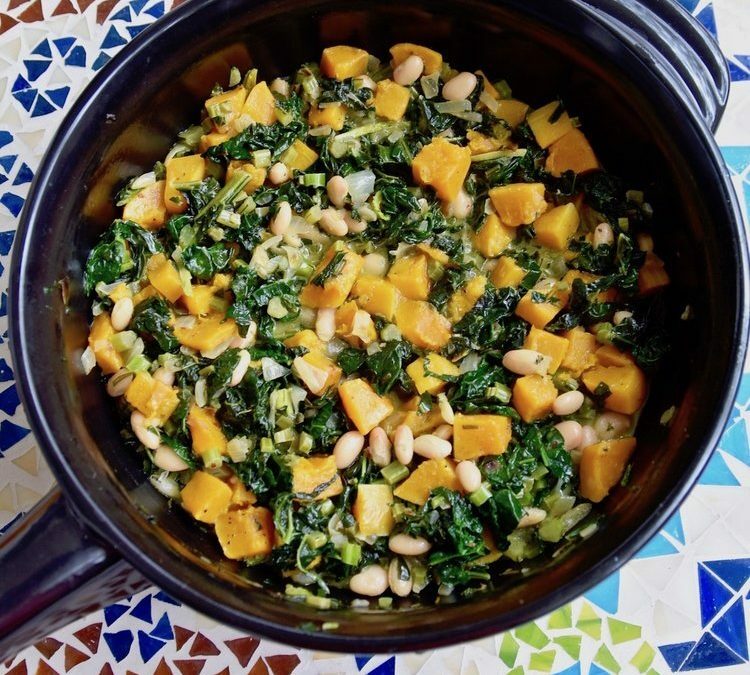 Not only is this kale sweet potato white bean skillet healthy by hitting your fat, fiber and protein buckets, it also happens to taste really good too. And it’s always important to make a meal that you enjoy! 1. Heat 1/2 tablespoon of coconut oil over medium heat in a large skillet (I love my ceramic Xtrema skillet mentioned and pictured in the photos). Place the onion in the pan and sauté until translucent, and then add the sweet potatoes and cover for about 5 minutes. Season with salt, pepper, cumin and curry powder, and remove from the pan. 2. Add 1 tablespoon coconut oil to the pan and then throw in the kale. Lightly salt and pepper. You can add more seasoning at the end if desired. Stir until the kale is slightly wilted and then add the coconut milk and cover. Allow to cook for about 10-15 minutes or until tender. 3. Combine the cooked sweet potatoes, cannellini beans and red pepper with the kale. Stir and cover for a few minutes, until heated through. Adjust the seasoning as necessary and serve.